Dr. Eric Thomas Weber is Executive Director of the Society of Philosophers in America (SOPHIA), co-host of the syndicated Philosophy Bakes Bread radio show and podcast (hear it on WRFL 88.1 FM in Lexington), and the author of four books, including Morality, Leadership, & Public Policy (2010), Democracy and Leadership: On Pragmatism and Virtue (2013) and Uniting Mississippi: Democracy and Leadership in the South (2015) as well as many articles. Weber is currently serving as a visiting associate professor of Educational Policy Studies and Evaluation at the University of Kentucky. 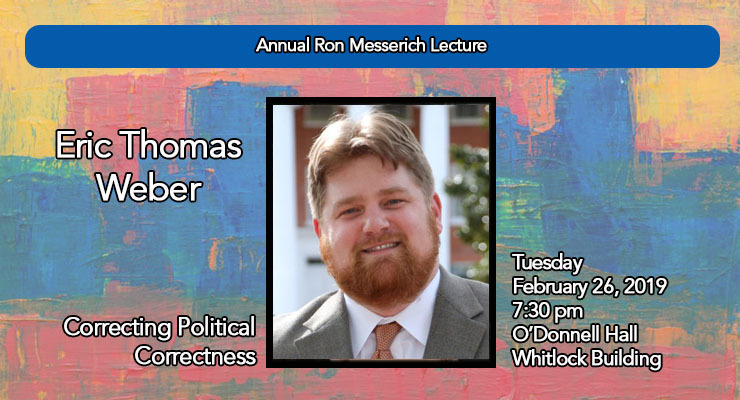 Prior to joining the University of Kentucky, he taught in the department of Public Policy Leadership at the University of Mississippi, where he was awarded the Cora Lee Graham Award for Outstanding Teaching, the Thomas F. Frist Award for Student Service, and the Mississippi Humanities Council's Public Scholar Award. SOPHIA, which he leads, was recognized with the 2017 American Philosophical Association and Philosophy Documentation Center Prize for Excellence and Innovation in Philosophy Programs. You can connect with him on Facebook at Facebook.com/EricThomasWeberAuthor and on Twitter @EricTWeber. Sponsored by the Department of History, Philosophy and Religious Studies and the Honors Program.